"Things will not calm down, Daniel Jackson. They will most definitely calm up." The original Stargate film appeared in 1994 and became a surprising breakout hit for young filmmakers Roland Emmerich and Dean Devlin (Independence Day, The Patriot). The science-fiction epic starred Kurt Russell as Colonel Jack O'Neill and James Spader as Dr. Daniel Jackson. In a 1998 online review, I described it as "an ambitious fantasy that unfortunately does not create feelings in our hearts." The special effects and set design were breathtaking, but the overall execution was sloppy. I enjoyed the intriguing premise of an ancient gateway to distant worlds, but it still fell short of expectations. Following its rampant success, MGM comissioned Jonathan Glassner and Brad Wright to create a television series based on the feature film. It originally aired on Showtime and starred Richard Dean Anderson (Macgyver) as a more enjoyable version of Russell's character. Although he is a serious military man, this version of O'Neill spouts wisecracks laced with sarcasm in even the most dire situations. Michael Shanks replaced James Spader as the archeologist Dr. Daniel Jackson, and Amanda Tapping appeared as the brilliant scientist Captain Samantha Carter. The series also created Teal'c (Christopher Judge)�an intriguing enemy Jaffar guard who revolts against his master and saves their lives. Under the guidance of General Hammond (Don S. Davis, Twin Peaks), the SGC teams utilize the Stargate to explore unknown worlds and battle the evil menace of the Goa'uld. Ra (Jaye Davidson) was one of their System Lords, and similar villains remain to wreak havoc on innocent socities. A primary enemy is Apophis (Peter Williams)�a harsh, arrogant ruler with no qualms about destroying entire civilizations. O'Neill, Jackson, Carter, and Teal'c are the members of SG-1, and they always seem to get involved in their share of trouble. Alien forces often invade their bodies, and their own government sometimes causes as many problems as the Goa'uld. 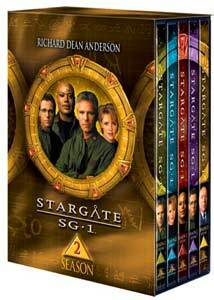 This five-disc DVD set encompasses the complete second season of Stargate SG-1 in impressive fashion. This material works much better in series form, with each actor able to expand their character gradually during a larger time frame. The effects do look artificial sometimes, but they still are remarkable considering the limitations of the format and budget. The writers actually remember past episodes, and it has more of an ongoing story feeling than a show like Star Trek. Anderson brings considerable charisma to O'Neill (more than Russell), and Tapping is especially believable as Captain Carter. Judge and Shanks also perform well, drawing emotional impact from possibly one-note individuals. The original season set the basic groundwork for each character and their enemies. This collection allows the writers to go further in-depth and expand the horizons of the series. Many episodes reference back to earlier moments, and inventive revelations keep the story moving forward. There are a few throwaways, but the overall quality remains high throughout the season. This action-packed episode picks up immediately where the cliffhanger ended during the finale of Season One. The SG-1 team are trapped on a Goa'uld ship heading towards Earth to decimate the planet. Its leader is young Klorel�the former slave who has become the evil son of archenemy Apophis. Working against the clock to prevent disaster, SG-1 must conduct a virtual suicide mission in a desperate attempt to stop the Goa'uld leaders. They receive assistance on the inside from Teal'c's mentor Bra'tac, but the odds against their success continue to increase. Meanwhile, General Hammond battles his superiors and retains a slim hope for his team's survival. Planning for the worst conditions, he sends a small Alpha team through the Stargate to keep the human race alive. Season Two starts out energetically with this effective story that showcases heroism from each member of the SG-1 group. The digital effects are surprisingly believable and reflect one of the better overall designs of the season. Even within the chaos, Anderson injects some fun one-liners and keeps everything from growing too serious. There are a few bad clich�s, including the digital readout on the timer and a "I'm not leaving you!" type of scene, but it still provides an entertaining ride. I especially enjoyed a quiet moment near the conclusion, where everything stops for a refreshing interlude. This episode rates 4 out of 5 Stargates. During an expedition to a planet under an intense attack, a strange force enters Carter and takes control of her body. SG-1 quickly discover that their friend has become a Goa'uld and imprison her for questioning. They realize that removing the invader and keeping Carter alive is nearly impossible, but continue to struggle for a solution. Events become more complicated when the Goa'uld claims to be part of a rebel faction called the Tok'ra. This tale occurs almost entirely at the SG-1 base, and it tackles a smaller story of more personal conflicts. O'Neill realizes that his first responsibility is to discover valuable information from this Goa'uld, but it becomes more difficult since it still looks like Carter. While this is not one of the best episodes, it does contain several key revelations that will continue to play a pivotal role later in the season. It moves along nicely and has some nice interplay, but it never moves into compelling territory. When SG-1 inadvertently assists a criminal during an expedition, they are sentenced to life imprisonment on a remote planet. The Taldor (meaning justice) give them little chance to defend themselves and ship the group to a raucous prison. Hope for escape comes from Linea�a mysterious woman who possesses remarkable scientific skills. Unfortunately, she is not telling them everything, and her payback for helping SG-1 may be severe. Much of this episode is a formulaic prison story with the usual assortment of dumb roughnecks and nasty conditions. Linea is an interesting figure, especially for a scientist like Carter. However, the story lumbers along and features little dramatic tension. Its one saving grace is a surprising final twist that may unleash more trouble in the future. This episode is also noteworthy for General Hammond's first journey through the Stargate. While exploring a strange garden, the SG-1 team is captured by a strange machine that attaches to each member's brain. For unexplained reasons, O'Neill repeatedly relives the traumatic death of his close military comrades, and Daniel watches his parents die. These moments originate within their memories, and this "game" has sprung from these tragic experiences. Events become even more complicated by the appearance of The Keeper, who controls this virtual world and considers them "new software. "Although it hardly corresponds with the larger fight against the Goa'uld, this episode is a highly enjoyable science fiction tale. It provides us with new background on O'Neill and Daniel's past while remaining an entertaining yarn. This virtual world idea has been presented numerous times before, but it generally remains fresh here. I especially enjoyed scenes with a false General Hammond, who acts completely unusual, much to O'Neill's bewilderment. This episode rates 3.5 out of 5 Stargates. When Daniel performs a chivalrous act and stops a beautiful woman (Shyla) from killing herself, her father Pyros does not seem very grateful. He controls the mines that keep the planet moving, and his paranoia causes him to force O'Neill, Carter, and Teal'c to work there. Meanwhile, Shyla believes that Daniel is her destiny and convinces him to use the sarcophagus. This wreaks tremendous havoc with Daniels' system and causes him to forget about his struggling friends. Michael Shanks receives his first showcase episode of the season and does a nice job portraying Daniel's personality changes. Sadly, this is one of the few worthwhile elements of this mediocre episode. The story does provide a possible reason for the evil ways of the Goa'uld, but it's only briefly covered. Shanks' deft performance is notable, but it fails to make this more than an average episode. SG-1 returns to Cimarria to investigate a distress signal transmitted through the Stargate. During their first visit, a defense mechanism created to destroy all Goa'ulds targeted Teal'c for death. The team destroyed the machine to save his life, but also removed the people's only defense. Hemron, a powerful System Lord and the son of Ra, poses a serious threat to this planet and has already killed over half the people there. In a last-minute effort to save the day, Daniel and Carter must solve a strange riddle involving the Norse god Thor. This frenetic episode pumps up the actions and reveals a significant threat to SG-1's survival. It also presents the first appearance of the Asgard race, who possess technology well beyond humanity. With the exception of some hokey images of Thor (which are explained), this episode cracks on all cylinders. The Goa'uld also continue to showcase their terrible shooting skills, which consistently misses our heroes from close range. This story begins with SG-1 exploring an apparently uninhabited planet with a resemblance to our moon. Surprisingly, they discover a strange alien artifact that stems from a civilization that became extinct 100,000 years ago. Further study reveals that the orb's technology far surpasses Earth's, and two new elements are discovered for the Periodic Table. Unfortunately, complications arise and the alien organism strikes O'Neill. It quickly infects the base, and SG-1 must act fast to save themselves and their world. Although it has a decent concept, this is the dullest episode of the season to this point. Nothing much happens, and the alien effects look similar to cheap lights displayed onto the set. Its lone saving grace is some nice interaction between Teal'c and O'Neill that shows their strong bond. The conclusion offers some unintended laughs, with the Colonel speaking with a silly low voice. While mildly diverting, this episode fails to inspire much interest. Bra'tac unexpectedly arrives at the base with saddening news for Teal'c about his son Rya'c. Apophis did not die in his ship's explosion, and now he has brainwashed the boy and used him as bait. SG-1 must knowingly enter a trap in a desperate attempt to save Rya'c from the clutches of the vicious Goa'uld leader. This task will not be easy since the child considers his father a traitor. Complications also ensue when Teal'c learns that his wife has been remarried with his best friend, Fro'tac. Christopher Judge shines in this top-notch episode that contains several surprising twists. Teal'c generally remains stoic, but his feelings about his wife and child are strong. When he discovers her remarriage and his son's transformation, the emotions spring to the forefront. Judge always keeps the tone believable, and it leads to a powerful entry. The action sputters a bit during the quick conclusion, but the overall effect is impressive. In perhaps the most important episode of the season, Daniel returns to Abydos (site of the feature film) to inform his father-in-law that he has not found his wife Sha'are. Unbelievably, she has been residing there for several months, and is pregnant with a child from Apophis. This creates a difficult problem for Daniel, who will lose his wife once again to the Goa'uld within her body once the child is born. The System Lord Heru-ur has also arrived to thwart the plans of his enemy Apophis. Meanwhile, O'Neill and Carter have traveled to Washington to receive medals for their work in "The Serpent's Lair." During their stay, Carter encounters her father�who has much different plans for her career�and O'Neill meets a reporter with aims to break the Stargate story. The show is really hitting its stride now, and this episode is arguably the most important entry of the second season. Each individual story line has its own compelling elements and a few surprises too. All four actors (especially Shanks and Tapping) give standout performances here and showcase the reasons for SG-1's continued popularity. I especially enjoyed Anderson's reaction to an eye-opening tragedy possibly caused by his superiors. Filled with both exciting action and tough emotional moments, Secrets is the best episode of the season. This episode rates 4.5 out of 5 Stargates. While investigating a planet with tremendous technology and no people, SG-1 faces attack from a horde of giant insects. They escape through the Stargate, but not before Teal'c is stung on the back. Upon their return, he begins to transform into an unknown form that makes little sense to the doctors. Colonel Mayborne appears and has military interests in the insect, which places him in conflict with the SG-1 team. After he escapes into the city, both sides search for Teal'c while Dr. Frasier and Dr. Harlow try to discover a cure. Christopher Judge does a nice job presenting the pain and confusion occurring in Teal'c's mind. Unfortunately, this episode ranks among the worst of the season. I found little interest in this recycled plot that combines ideas from past films and sci-fi series. Even the warm-hearted interaction between Teal'c and a misfit young girl seems awkward here. This story is notable for containing possibly the nastiest make-up effects of the season. This episode rates 1.5 out of 5 Stargates. Carter has a vivid dream about the Tok'ra�the rebellious branch of the Goa'uld introduced by Jolinar in In the Line of Duty. This vision causes her to locate their current residence, which leads to the first meeting between SG-1 and the Tok'ra. Jacob Carter lies near death from cancer, but he wants his daughter to stay away from the hospital. Traveling with a heavy heart, she discovers startling revelations about Jolinar from Martouf, a friendly member of the group. Unfortunately, SG-1's proposed alliance may be difficult to ascertain from the Tok'ra, who do not recognize its benefits. We finally receive the payoff of Jolinar's news about the Tok'ra, who turn out to be more skeptical than anticipated. The impressive story development alone makes this entry worthwhile. Additionally, there are some touching emotional moments from Carter while learning about her former Goa'uld inhabitant. I especially enjoyed the Tok'ra concept of a symbiotic relationship with their host, which is an intriguing concept. Much of this episode is plot-driven and sets up the major events of part two. In a last-ditch effort to save both her dad's life and a chance for an alliance, Carter offers her father as a host for the dying Tok'ra leader. No one is sure if this action will save both of their lives, but they feel that it is worth a shot. Events grow dire when Goa'uld mother ships appear above the planet and launch an all-out assault on their enemies. Will SG-1 be able to escape after assuring that Carter's dad is safe? If so, they will possess an essential strategic alliance with the Tok'ra that could lead to an eventual victory. This worthy conclusion presents the Tok'ra in a more favorable light and allows redemption for Carter's grumpy father. Their interaction before the procedure is especially heartwarming and reveals a caring man beneath the rough exterior. I imagine that the Tok'ra will play a pivotal role in future dealings with the Goa'uld, and Martouf could be an interesting match for Carter. SG-1 journeys to the world of the Salish, a people that closely resemble Native American Indians. Their first priority is to investigate the strange disappearance of SG-11, who were planning to mine an extremely valuable ore. They must also try to negotiate a mining treaty with the Salish, represented by friendly fellow named Tonane. This planet supposedly harbors powerful spirits, who take the form of natural creatures like wolves. When events turn sour at the SGC base, the apparently benign spirits reveal their true powers. This mediocre episode reveals then military's willingness to ignore a weaker people's rights when it suits their goals. Even General Hammond sticks to the party line with a "what they don't know won't hurt them" speech. I found the concept of a harmonious community guarded by "spirits" mildly interesting, but this tale lacks the originality to place it among the top episodes. Much of the action is pretty low-key, and it only picks up near the conclusion. I do like the idea of being able to make someone disappear just by crossing my arms. That would come in handy sometimes in daily life. When SG-1 discover the existence of the Touchstone, which controls the weather of a planet, they return there for further study. However, thieves have stolen the device in the night, throwing the weather into rampant disarray. Who knew about the stone's power and had the means to steal it. The answers could lie within the United States military, who desire more concrete results from the Stargate project. This forces SG-1 to travel to Area 51 in search of the second gate, which supposedly was placed under wraps after its discovery in Antarctica. Once again, this tale presents the troubling figures within the U.S. Government who want to subvert the Stargate for their own motives. While none of the key players are revealed, we do get the idea that sinister elements are lurking behind the scenes. Tom Mcbeath's sniveling Colonel Mayborne returns again to torment SG-1, but he is only a minor player in a larger scheme. The Area 51 visit provides a nice background into studies occurring as a result of past missions. This episode is intriguing and represents a refreshing change from the usual plots focusing on strange aliens. Carter: Sir, by some fluke of Stargate technology, we are witnessing something that the laws of physics say we can't possibly witness. O'Neill: We are witnessing good men dying in slow motion, Captain. In perhaps the most intriguing opening of the season, stars and planets soar by the camera into a massive black hole. Another SGC team rushes across the desert to open the Stargate and escape certain destruction. Everything happens in slow motion, which makes this dire moment even more eerie. SG-1 is ready to leave headquarters to save their abandoned mates, but the black hole has rendered any transport impossible. In fact, it now has latched onto the Stargate, which could pull Earth into its clutches. While everyone scrambles for a solution, time slows down due to the gravitational forces pulling on the base. This story ranks among the most original screenplays of the season. The time differences are very entertaining in that days pass on the surface while scant minutes occur underground. Hammond flies to Washington, meets with the president, and returns to SGC within only a few moments. Also enjoyable is Carter's scientific talk, which continually baffles O'Neill and the other military officials. We also learn a major revelation about the Colonel and his time spent in prison. While not among the top echelon of episodes, this entry does offert an inventive science-fiction premise. SG-1 arrives in an ancient room with no apparent exit or importance. When O'Neill steps towards a strange light, however, it grabs his head and downloads unexplained information into his brain. Upon their return, everything appears normal, until he begins replacing common terms with alien phrases. His progression continues to move towards complete insanity while his brain allows him to do unbelievable things. Can SG-1 discover a solution to save him from a total meltdown? Although initially disguised as just another alien takeover episode, this story actually plays a pivotal role in explaining the creation of the Stargate. We also learn more about the Asgard race, who first appeared in Thor's Chariot. Richard Dean Anderson gives a enjoyably quirky performance while hardly saying a word. The ending is one of the truly magical moments of the season. Apophis begs SG-1 for sanctuary from the Goa'uld who plan to exploit his weakness and destroy him. Back at the base, he lies near death and tries all types of methods to avoid his fate. An ancient and powerful System Lord named Sokar has tortured him and wants revenge for an earlier defeat. If the Stargate team is willing to provide Apophis with a new host, he will give them all of his Goa'uld knowledge. Will they cave and give him another chance at life? Time is not on their side, as Sokar is already planning to attack Earth. Finally, SG-1 has a chance to wreak revenge against the hated System Lord who has caused so many people unbelievable pain. The conflict between their hatred of this being and inherent goodness is especially interesting during this episode. All of them want him dead, but no one wishes to yield to another evil Goa'uld. Peter Williams once again brings considerable weight to Apophis even while lying immobile. The final result is not unexpected, but it still leaves many questions unanswered. While viewing this episode, I got the feeling that this was not the last we would seen of Apophis. Once again, the team arrives into a small chamber of odd devices. This time, they meet a very old man named Ma'chello who has fought the Goa'uld for years. He invites Daniel to examine one of his machines, which causes them to switch bodies. While the former old man takes a holiday through the city, Daniel is trapped inside a dying body. Teal'c and O'Neill try to retrieve the device, and they also exchange bodies. Is there any way for them to return to their original forms, or is everyone stuck for good? While the police search for Ma'chello, Carter attempts to discover a solution to this odd dilemma. This clever twist allows the actors to have some fun mimicking the other's mannerisms. Anderson must speak in a slow, deliberate manner to match Teal'c, while Judge mimics O'Neill's dry, sarcastic tone. Shanks plays both Daniel and Ma'chello, which makes their final verbal confrontation an actor arguing with himself. While quirky and mostly enjoyable, this is not one of my favorite entries. It works as light entertainment, but lacks the extra touches required of the best episodes. SG-1 encounters a peculiar race of pale alien beings who have no apparent forms of communication. Without any warning, countless numbers fall extremely ill and near death. Dr. Fraiser makes a housecall on the planet, but she can discern no reasons for this outbreak. A possible explanation lies in the strange white plants that quickly dissipate upon close contact. Could SG-1's arrival destroy an entire civilization? The idea of Stargate teams bringing deadly viruses to other planets is intriguing, but I found few elements of interest here. The pace is pretty slow, and the odd aliens grew old quickly. This episode does feature some classic harsh words between Daniel and O'Neill, especially concerning the Colonel's views on mythology. That interplay keeps the story from being a total clunker, but it's only a minor reprieve. A small, hooded figure emerges from the Stargate. The technicians had attempted to close the iris, but something was blocking their efforts. This unknown entity is actually a young human boy sent by an alien race to communicate with O'Neill. These Re'tu slightly resemble the bugs from Starship Troopers, and they want to warn the SGC of a potential attack. A rebel faction wants to destroy all the Goa'uld hosts (a difficult proposition), so they supposedly plan to attack Earth. The eventual battle could mark the end of SG-1 and the entire base. Following a dull episode, this action-packed story is especially refreshing. Everyone gets involved in the fight against an apparently invisible enemy. Carter's father returns from the Tok'ra planet to help them, and his appearance is always welcome. The moments with the boy and O'Neill are a bit awkward, but they make sense due to the boy's few past experiences with humans. Then firefight is pretty intense, especially for a network series. While not one of the most complex tales, this one still packs a strong wallop. While passing through the Stargate, SG-1 is shot intercepted by a random solar flare and shot back in time to 1969. After escaping from the military (who think they're Russian spies), they join two hippies and travel across the country. Their destination is New York, where a woman lives who would know the destination of the dormant Stargate. They must hurry, however, because only a solar flare can return them to the present day. The timing must be perfect, or they could end up trapped anywhere in time. Although time-travel plots generally fall apart on science-fiction series, this one provides one of the most entertaining episodes of the season. If you can ignore the time paradoxes involving a note from General Hammond, this story gives an enjoyable ride. The journey across the country is lots of fun, with SG-1 having to don cheap clothes to blend into the environment. Seeing Teal'c dressed in pink bandana and purple shirt is a classic moment. They even quickly pass through St. Louis, which is always a highlight. Their rainbow-colored bus resembles something out of The Muppet Movie, but the events never grow too ridiculous. O'Neill awakes to discover that his entire SG-1 team and everyone he knew has been killed. The year is 2077, and he has spent nearly 80 years within a cryogenic sleep. SGC has expanded to 28 teams and moved to outer planets, and the current General wants to discover what happened to O'Neill and his team. They hook up a strange device to his brain, and his memories (clips from Seasons 1 and 2) play over the monitors. Everything seems normal, but he begins to discover glimpses that all may not be as it seems. Are the Goa'uld involved? Are the rest of SG-1 really gone? This conclusion to the second season depicts an intriguing premise, but too much time is wasted on moments we've already seen. I have no big problems with having a highlights show to bring new viewers up to speed, but it does it have to be the finale? Luckily, the second half of the episode focuses on the current story. The tense cliffhanger ending will leave you wanting to watch Season Three, which might not be released for quite a while.This episode rates 3 out of 5 Stargates. Image Transfer Review: Stargate: SG-1 originally aired on Showtime in a full-frame format, but these episodes utilize a 1.78:1 widescreen anamorphic transfer. Even considering its television origins, the picture on this release is a minor disappointment. Certain moments are just too hazy and lack the pristine clarity of the better digital transfers. The digital effects and bright outdoor scenes often look impressive, but there are too many sub-par moments to warrant a higher grade. There's no need to worry about the transfer distracting too much from your enjoyment of the series. The overall picture is acceptable, but it falls into that mediocre strata of image transfers. Audio Transfer Review: This release offers a simple but effective 5.1-channel Dolby Surround track that presents the powerful score nicely through the front speakers. The credits sequence sounds excellent, and the explosions and Stargate effects spring well from the transfer. Limitations do exist due to the television source material, which prevents a more complex presentation from the rear sections. However, I really have no major complaints about the audio quality, which stands up well to its DVD peers. Extras Review: Each Stargate SG-1 episode conains the television preview and five chapter cues. Each trailer runs for 45 seconds and appears in a decent full-screen transfer. Also included on three of the discs are brief featurettes about certain aspects of the series. Disc 1 features a seven-minute profile of production designer Richard Hudolin, which combines short interview clips with footage from the series. While too brief and promotional to provide much depth, this piece does give us a nice overview of his ideas and their incorporation into each story. Disc 4 contains a nine-minute feature on Michael Shanks and his character, Dr. Daniel Jackson. Backed by the usual narrator, we learn about the character's beginnings and his progression, with shots from later seasons also shown. Shanks describes getting the part and his enjoyment of working on the series, and clips play between his statements. Disc Five includes a similar ten-minute profile of Teal'c and actor Christopher Judge. It follows the promotional route once again, but does have some interesting tidbits from the well-spoken actor. The lack of any significant extra features on this set is frustrating due to the wealth of possibilies available. First of all, it should contain biographies of the key stars, who are not well-known except Richard Dean Anderson. I also would have enjoyed a deeper behind-the-scenes look at the production, possibly by exploring the creation of a single episode. Bringing Anderson and the creators in for a commentary on an episode or two would also be a great prize for devout fans. The release of the 2nd season will still undoubtedly please them, but a few more extras would have even increased its value. Stargate SG-1 continues to air new episodes on the Sci-Fi Channel. Now in its sixth season, the series still maintains a high level of popularity and continues to stretch the boundaries of the genre. While this season may be the last one, rumors abound about a possible SG-1 feature film in the works for 2003. This five-disc set is strongly recommended for both diehard fans and new viewers like myself who only recently have discovered this top-notch show.